Don’t Panic ! Volatility in the UK and worldwide stock markets is scary, but.. There has been a lot of noise in the press concerning the markets following a sudden dip in world markets on Monday, August 24th, and again today, Tuesday, September 1st. I thought I might weigh in with a few thoughts of my own since this is a matter of concern to people, and many investors are wondering what to do for the best. One thing to remember is that it is impossible to “time” one’s investments into and out of the markets with any consistency. You will never buy at the bottom nor sell at the top. What an investor needs is a good plan and to stick to it. Investors who are exposed to the markets should really be looking at 5 to 10 years, as the longer you are invested the more likely you are to make expected returns – i.e. time mitigates risk. A person’s investment portfolio needs to be diversified across a number of different asset types, and across different geographical regions, in a sensible combination designed to reflect that investors ability to withstand loss, and their taste for risk. For those who follow this line of diversified investing, there is probably little to do at the present time except sit tight, or perhaps re-balance their holdings if necessary. You might ask yourself whether your portfolio still reflects your long-term objectives and taste for risk, but try not to be negatively influenced by short-term fears in such an assessment. When in doubt, discuss with your investment adviser. If you don’t have an investment adviser, I suggest you get one since the long term improved returns can be expected to outweigh the fee charged. When there are sudden market drops, investors are likely to focus on other perceived negatives – this is just human nature. But this just reinforces the negative view, leading to an escalation in negative sentiment all round. This can cause irrational selling. And remember, the automated trading programs plugged into the markets nowadays control literally £ billions (if not £ trillions) of assets, and if they trigger we can see huge sudden shifts in stock prices – in the USA massive blue chips like Microsoft lost up to 10% in a very short period before mostly recovering. When a sell-off is driven by adverse sentiment rather than by adverse fundamentals, it tends to be relatively short term, and savvy fund managers are likely to take advantage of buying opportunities. Of course, whether a dip in the market is indicative of further falls to come is extremely difficult to predict. But one thing most investment experts will agree upon is that you should never sell at a significant low point in the cycle. In other words, try not to give in to fear, but be prepared to ride out the storm, i.e. stay invested. The chart below shows how staying invested is likely to be better in the long term than trying to jump in and out of the market. 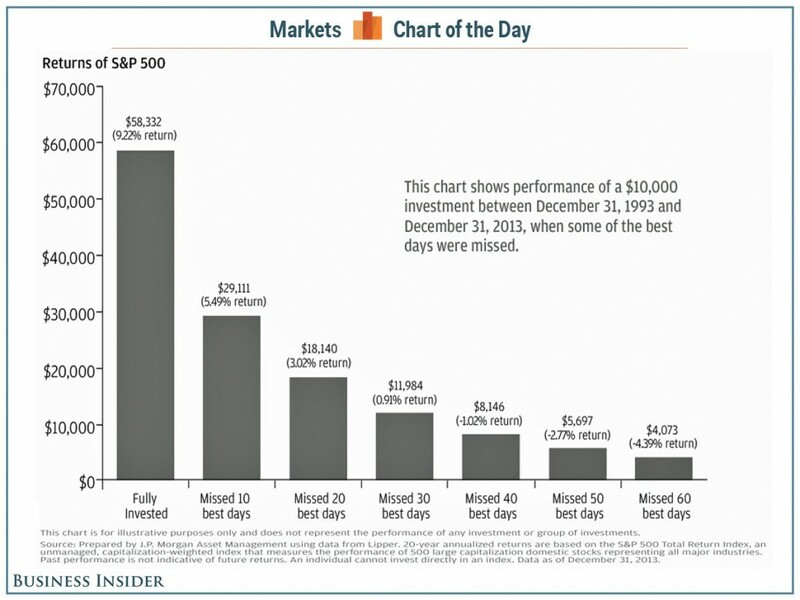 Market rises can be just as sudden as market falls and the chart shows clearly the cost to an investor of being un-invested on certain “best” days over a ten-year period. The chart above (courtesy JP Morgan) demonstrates the cost to an investor of being out of the market at the wrong time. It is impossible to time the market with any consistency, so why try? 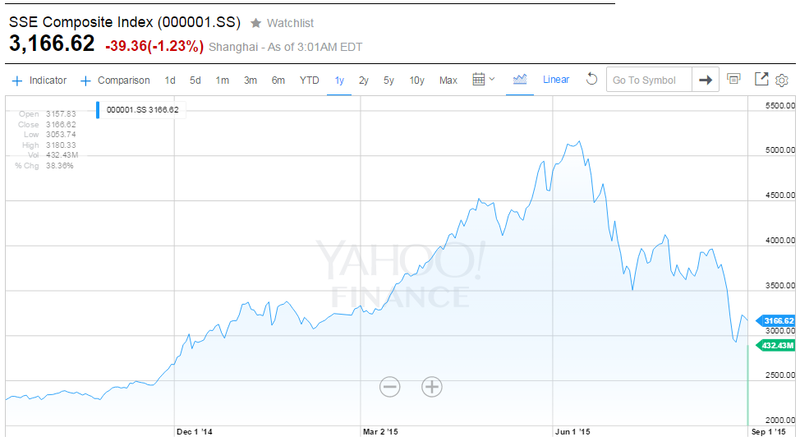 Putting some of the recent market drops into perspective, by far the biggest has been the Chinese stock market. You will note from the chart below that the Shanghai Composite index at the time of writing this article was at 3166 following its high in mid June of 5166, a drop of nearly 40%. But please also note that over the last 12 months, it is still over 38% higher than where it stood a year ago on September 3, 2014! What is more, it has been falling quite rapidly since mid-June. In other words, weakness in China has been anticipated for quite some time leading up to the global dip on August 24th 2015. Clearly some of the recent volatility in the global economy was caused by uncertainty over China, including the relatively sudden Chinese devaluation of its currency in mid August. But this was not a significant devaluation, only a little over 3% against the US dollar. Again, this need not have a fundamental effect on the global economy. 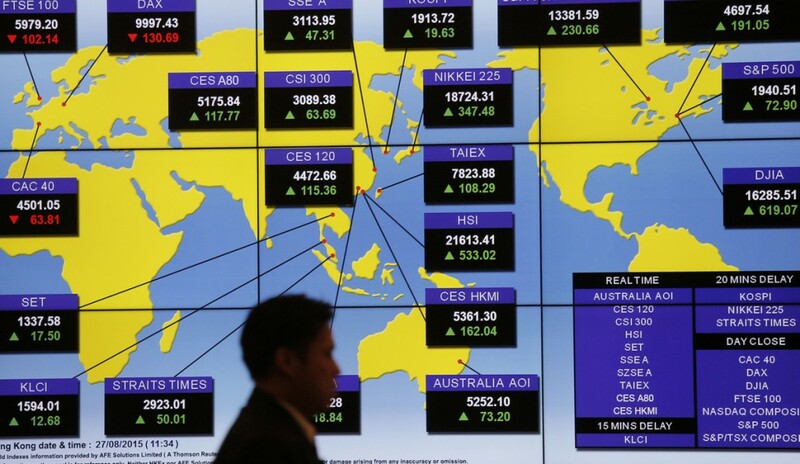 China has been a trigger to a more general correction. I have been telling my clients to expect volatility during 2015-2016, whilst also anticipating overall positive returns, (though not of the scale of the preceding twelve months). I still hold this view. A serious long-term fall in world financial markets needs to be accompanied by a serious worldwide recession, and we simply do not have that situation at present. 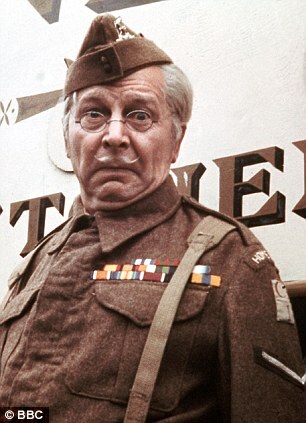 Clearly, when the FTSE, the Dow Jones, the European markets and Asian markets all take a hit it is cause for concern. But I think what we have seen is a market correction, or re-pricing. It was a pretty big one, and has caused some pain, but I don’t think it precedes a major crash. Indeed many pundits felt it was due. Going forward, we may see a fairly rapid recovery in those markets where the fundamentals remain unchanged.